You can customize the look and feel of your location's website portal where patient's can view information about your office. Your profile can also include a logo, photos, and links to your office's pages on popular social media websites. Patients can see your profile when they confirm their appointments from email or text message reminders. Note: Website profiles are location specific (each location of your organization has its own website profile). However, the profile photo, other photos, and the social media links are organization specific (for all your locations). On the Settings menu, under Location, click (or tap) Web Profile. The Web Profile page opens. On a location's Web Profile page, customize your banner color, upload a logo, upload a profile photo, change your location details and business hours, upload and remove photos, and add and remove social media links as needed. Banner color - Choose the base color of the gradient for the banner at the top of the profile page. Click (or tap) Upload your Logo to add a logo (a .jpg, .png, or .gif file up to 4MB in size) that has been saved on your computer to the banner. Click (or tap) Pick a Generic Logo to choose one of the pre-defined, generic logos for the banner. Location details - The location name, address, and phone number appear for your reference. You cannot change this information from this page, but you can, if you have sufficient user rights, change it from the Location Information page). The location's office hours appear for your reference, to change the office's business hours, click the Edit link. 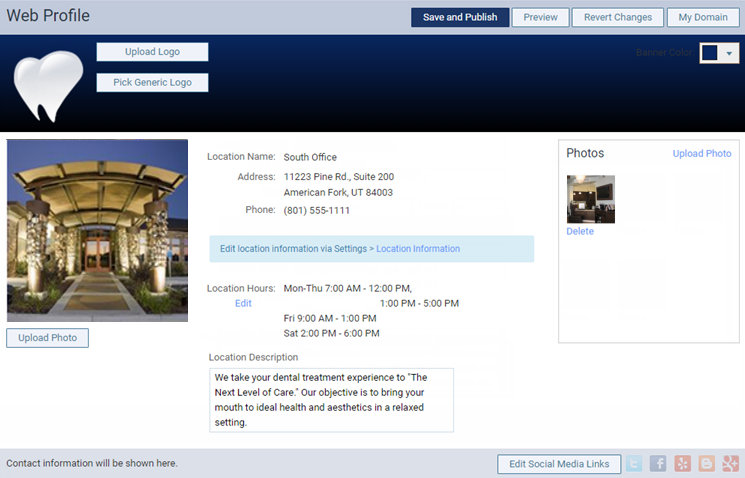 Also, type a brief description of your practice in the Location Description field. Organization Profile Photo - Click (or tap) Upload Photo to add a photo to your organization's profile (a .jpg, .png, or .gif file up to 4MB in size) that has been saved on your computer. This photo is associated with your organization (all locations). Photos - Click (or tap) Upload Photo to add photos (a .jpg, .png, or .gif file up to 4MB in size) of your organization's office and staff or any other type of photo that has been saved on your computer. These photos are associated with your organization (all locations). 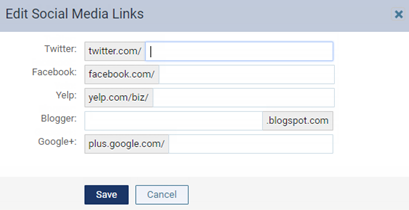 Social media links - To set up or change the links for the icons that patients can click to visit your organization's pages on popular social media websites, click (or tap) Edit Social Media Links. Complete the website addresses (URLs) as needed for Twitter, Facebook, Yelp, Blogger, and/or Google+, and then click (or tap) Done. These links are associated with your organization (all locations). Click (or tap) Revert changes to undo all changes made since the last time you saved the profile settings. This button is available only if you have made at least one change. Click (or tap) Preview to view the profile page of your practice's website as others will see it with any changes you have made. Click (or tap) My Domain to edit the sub-domain name of the URL (website address) that patients will use to access your website portal. In the My Domain Settings dialog box, change the Domain Name, and then click (or tap) Search to verify that the name you entered is valid. Next, if there is no error and the domain name is available, click (or tap) Create. After you change the domain name, be sure to change any links from external websites (such as Twitter or Facebook) to your website portal to reflect the changed sub-domain name. Note: Only letters and numbers (no special characters or spaces) are allowed for the sub-domain name. 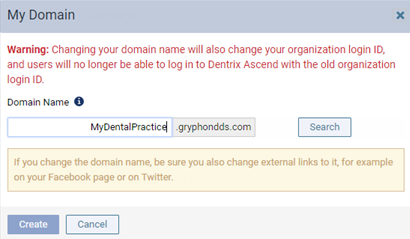 Warning: Changing your domain name will also change your organization login ID, and users will no longer be able to log in to Dentrix Ascend with the old organization login ID. To apply the changes to the profile page of your location's website, click (or tap) Save and Publish. This button is available only if you have made at least one change.